Avoiding injury in the cold – top tips! The cold weather has well and truly set in, and while it’s so far been a bit warmer than usual, were surely in for some freezing conditions in the near future! While many people have already hung up their rackets, boots or gloves for the year there are still many people out looking to keep fit, ready for next season. This week, let’s look at some practical tips which will help you avoid a cold-related injury this winter. No matter the temperature or weather, exercise is a positive force in your life and should always be included – in fact, there is no air temperature below which exercise is actually unsafe, but this doesn’t mean you shouldn’t take precautions. Of course, one option is to move your training inside – for example, if you run for fitness, you might consider heading to the gym and sticking with the treadmill to avoid the worst of the ice. on especially cold days the risk of injuries such as sprains and strains is greater, and the theoretical risk of hypothermia and frostbite is increased – even if you are wrapped up appropriately. Frostbite, hypothermia? Actually, yes – the problem isn’t while your exercising, it’s the possible outcome if, for example, you encounter a situation where you are forced to stop exercising far from home, such as muscle cramp, or a sprain. Keep this in mind – if you’re a runner, avoid straying too far from home and stick to routes you know. If you’re a cyclist, make sure you carry a phone and a credit card with you in case a problem arises. We’re always taught to warm up before physical activity, but do we always do it? The fact is that cold and cramped muscles are more likely to be injured, so when the conditions themselves promote cold and cramp this point is even more important. The problem is that very few of us actually warm up properly – a recent study of golfers concluded that of 1,040 participants (852 men and 188 women) over the age of 18 studied, only 54.3 per cent performed any form of warm-up activity. Air swings on the tee were the most commonly observed warm-up activity, with 88.7 per cent of golfers who did a warm-up opted for these. Perhaps golfers warm up less than runners or cyclists, but perhaps they don’t – perhaps we’re all lazy about warming up – and while you might get away with it in summer, you’re asking for trouble in winter. If you’re at all serious about sport an exercise, you’ll appreciate the importance of remaining hydrated – when the weather is nice it serves as a good mental cue to take enough water for the session ahead, in winter… not so much! Unfortunately, there is a tendency to assume that hydration is not as an important issue in cold-weather exercise – in a strictly theoretical sense this might be true, you do tend to sweat less in a colder climate – but for practical purposes, it really is just as important. Several factors increase the likelihood of dehydration in the cold. First, cold air tends to be very dry, especially at higher altitude, and in dry air more fluid is lost as vapour through breathing. Second, the cold tends to suppress thirst so that athletes drink less even when fluid is available. Third, cold-induced dieresis causes rapid fluid loss via urination, which often reduces the number of fluid athletes voluntarily chose to drink when exercising in the cold. To avoid dehydration in your winter workouts, drink water or a sports drink during all workouts lasting longer than an hour, even on the coldest days. Compensate for your reduced desire to drink by drinking on a schedule of four to six ounces every 10 to 15 minutes. Sports drinks are generally preferable to water for intense exercise because unlike water they replace the electrolyte minerals lost in sweat and provide carbohydrate energy. Historically, winter exercisers had the choice of going cold or going wet with a cotton tracksuit. For some, being colder was better than that “sweaty on the inside” feeling – you’ll warm up anyway, right? As we’ve already suggested, this isn’t the best way forward – and thankfully today there are better options! Most sports stores now carry specialist winter training kits which are specifically designed for this use. These products have several advantages over cotton clothes, everyday winter jackets and other items that are simply warm. Winter training clothing is made from breathable, moisture-wicking fabrics that trap just enough but not too much of the heat your working muscles produce against your skin while keeping your skin relatively dry, so that evaporative cooling doesn’t chill you. Winter technical apparel is also lighter, allows more freedom of movement, and is easier to layer than other types of clothing. 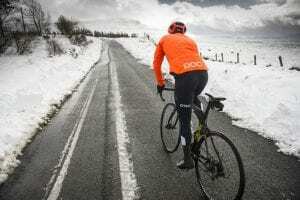 What’s more, proper winter kit does not cost the earth – check out affordable retailers like decathlon if saving some cash is more important to you than branding. So, how much clothing should you actually wear? As a general rule, you should dress so that you are uncomfortably cool but not miserably cold when you first step out the door and then become comfortable after about 10 minutes of activity as body heat accumulates. Depending on your exercise type, you might also want to wear layers which can be taken off once exercising. The following table provides a basic set of guidelines for how to dress in different temperatures. Perhaps the best way to make it through winter without an injury is to keep yourself in tip-top shape in the first place. Chiropractic care is an excellent way to do this since chiropractic does not only help to keep you moving, it can also enhance the range of motion of, for example, the hip joint, which is easily injured in the cold. Perhaps you can improve some elements of your sport over winter afterall!